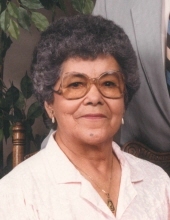 Esther Gallardo Montecino was born on March 27, 1921 in Arizona. After her birth; her parents Primitivo Gallardo and Paula Lopez moved the family to California, wher she attended local schools. She met her soulmate, Louis Montecino and together began raising their three children. They were married 75 wonderful years before Louis passing in 2010. Esther was a devote Catholic woman, who went to church every opportunity she had. Aside from her faith, Esther valued her family and knew the importance of togetherness. She made sure every one was taken care of and fed. She would often bring food to a sick family member or make a quick phone call to ensure a relative’s safety. Esther had a great sense of humor and quick wit, which was loved by everyone around her. Esther enjoyed music, being adventurous and making tortillas with her husband. Esther was a loving and caring mother, grandmother, great grandmother and great- great grandmother. She will be missed and loved. Esther is survived by her sons, Michael Montecino, Ronald Montecino and wife Liz Gerber; grandchildren, Ronald, Daniel, Ruben, Angela, Max, Miranda, David, Michele, Michael, Louise, Adrian, Andrew; Many great grandchildren and great- great grandchildren; niece, Evelyn Gallardo. She is preceded in death by her beloved husband, Louis Montecino; daughter, Yolanda Castañeda; granddaughter, Annette Aguliar, and two Raz grandbabies. To send flowers or a remembrance gift to the family of Esther Gallardo Montecino, please visit our Tribute Store. "Email Address" would like to share the life celebration of Esther Gallardo Montecino. Click on the "link" to go to share a favorite memory or leave a condolence message for the family.